Fabric-destroying insects cause much damage each year. In addition to large losses in commercial fabric manufacturing and storage operations, the many small damages caused in households add up to a significant figure. A hole in a $250 suit usually means a new suit will be purchased, a patch of carpet damaged under a sofa may require purchase of new carpeting the next time furniture is re-arranged. Other materials which are readily infested include sweaters, coats, upholstery, piano felts, blankets and any other woolen products. Furs, hair, leathers and hides, feathers, horns, insect and animal collections and such stored foods as meat, fish, meal and milk products are also vulnerable to these insects. Synthetic fibers and cellulose materials are damaged only incidentally, often because they are soiled with greasy food stains, body oils, or other residues which are the primary object of the insect attack. Just as the termites and some other pests create problems because of their ability to attack and utilize cellulose, the insect pests of fabrics are troublesome because of their ability to digest and utilize keratin as an energy source. Although the word keratin may seem rather foreign, it is a very important material to people. Keratin is the chief protein constituent of such human tissues as hair, fingernails and skin. In other mammals, keratin is the chief structural protein in horns, hoofs, and feathers. Keratin is a protein which is quite stable chemically and is very resistant to most means of digestion. Few animals are able to digest keratin, and these include only a relatively small number of insects. This peculiar ability to digest keratin, coupled with our widespread use of wool and other animal hair, is the basis of fabric pest problems in our societies. There are other insects capable of damaging fabrics by chewing or shredding, but they do not have the ability to digest keratin. Silverfish, cockroaches, crickets, and earwigs fall into this category. However, they are not considered true fabric pests. The most important fabric-destroying insects in the United States include two moths and four carpet beetles, although various other insect species may cause some damage occasionally or may be important locally. In recent years, there seems to have been an increase in carpet beetle problems throughout much of the United States, more so than clothes moth problems. The reasons for this resurgence are not clear. However, contributing factors probably include a trend in consumer preferences toward garments made of wool, silk, furs or feathers (and away from polyesters and other synthetics) and cancellation of registrations for use of long residual chlorinated hydrocarbon insecticides (e.g., DDT and Chlordane) against these fabric pests. The term "clothes moth" is properly used in connection with the webbing clothes moth, the casemaking clothes moth, and the tapestry or carpet moth. The first two species are more common, while tapestry moths occur only infrequently. These are all small moths, as adults have a wingspread of less than 1/2 inch. Their habits are different from most moths because they are rarely seen flying around lights at night. Rather, they prefer dark closets, attics or other areas and tend to live in dark corners, or in folds of fabric. They will fly occasionally, but normally only on the edges of a lighted area, so usually remain quite inconspicuous. Clothes moths have a complete metamorphosis. That means they have an egg, larvae, pupa and adult stage just like a butterfly. Adults are unable to feed and it is the larvae stage, which are small cream-colored caterpillars with brown head capsules, that damage fabrics. In houses, they are most frequently pests of clothing, carpets, rugs, upholstery fabrics, piano felts, brush bristles, blankets, hair from pets, furs, lint from woolens, and any stored wool or silk products. These products all contain the animal derived protein keratin. 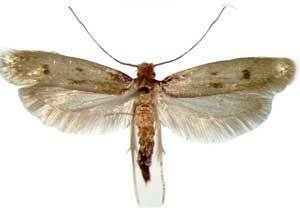 The Case Making Clothes Moth is not nearly as common as the webbing clothes moth. It is more frequently encountered in the southern United States, although it is rather generally distributed in the United States. This moth is more brown in color than the webbing clothes moth and has 3 dark spots on the wings which help to identify it. However, this characteristic should not be relied on since the spots are frequently quite indistinct and many wing scales may have been worn off, leaving no spots. Adult moths have a somewhat smaller wingspread than the webbing clothes moth. There is no tuft of reddish hairs arising from the top of the head of adult casemaking clothes moths, as there is with the webbing clothes moth. The larva spins a small silken cell, bag or "case" around itself and carries it about while it feeds. It moves about by extending its head and legs from the front end of the case. There is rarely any silken webbing spun on the fabric or other material where the larva feeds. Larvae wander about on food material feeding a little here and a little there, but rarely do extensive damage at any one spot or in a small area. When ready to pupate, the larva draws itself completely within its case, seals both ends of the case with silk and pupates in this cocoon. In the northern Unites States, pupae are usually the only stage found during the winter months, but all stages can be found in the South throughout the year. This moth is a particular pest of feathers and down, although it can feed readily on almost any material listed above as food for webbing clothes moths. Clothes moth larvae will, at times, damage other products such as cotton, linen, silk, synthetic fibers and paper. Such damage, however, is usually incidental, resulting from the larva damaging such fibers while eating its natural food. Clothes moth larvae are particularly damaging to fabrics stained with materials such as oil from human hair, human sweat, urine, beer, tomato juice, milk, and soft drinks. These caterpillars require a certain balance of nutrients in their diet to develop properly, and they especially need vitamin B. First instar larvae cannot survive on "clean" wool, but require the nutritional supplements found in soilage (body oils from the wearer of a garment). 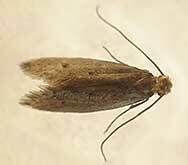 The Webbing Clothes Moth is the most commonly encountered clothes moth in the United States, found in all states. The body and wings of the adult are uniformly buff colored and its head has lightly reddish hairs on top. The wings are silvery brown, without spots and measure less than 1/2 inch across when extended. Adult males are capable of flying as far as 100 yards but seldom do so. Females are rather weak fliers, although they can fly for short distances within homes and elsewhere. Adult females can mate and lay eggs during the same day they emerge from the cocoon. Adults normally live about 15 to 30 days, although in colder weather this time may be extended somewhat. The eggs are oval, ivory-colored, and about 1/25 inch long. They are laid either singly or in small groups among the threads or in cracks of a suitable food material and are usually attached to this food material with a gelatinous secretion. Each female lays an average of 40 to 50 eggs, but some may lay up to 200. In the summer these eggs will hatch in 4 to 10 days, but in winter it may take a month or more. When using a microscope to examine damaged goods, you must be careful not to confuse eggs with the tiny, hard, characteristically bun-shaped particles of excrement which are left scattered about wherever the larvae have been active. These excrement particles are frequently of the same color as the fabric the larvae are feeding on. Larvae are shiny, creamy white in color, and not more than 1/2-inch long. They usually spin feeding tunnels of silk, but may produce somewhat randomly placed patches of silken webbing as they move about on the surface of a cloth article they are attacking. Some particles of the material on which they are feeding and bits of their own excrement are often entangled in the silk. These feeding tubes and silken patches together make up the webbing which is characteristic of this moth. In fur, webbing is generally sparse. Each larva molts from 5 to 45 times during its development. The time necessary to complete larval development can vary greatly and is dependent upon such things as availability and quality of food, relative humidity, and temperature. This variation may be anywhere from 35 days to as long as 2-1/2 years. The larva then spins a silken pupal case and attaches bits of fiber and excrement to the outside of it. This case is usually well hidden in the fabric which has been attacked. Length of the pupal stage varies from about 8 to 40 days. Adult webbing clothes moths may be found at any time of the year, but are more abundant during the warm summer months. They also develop quite well in heated buildings in the winter. The entire life cycle may vary from 55 days to 4 years, but normally will be between 65 to 90 days. 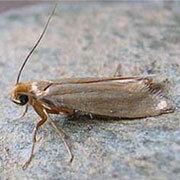 Three common species of grain moths are frequently found in homes. These include the Mediterranean flour moth, the Indian meal moth and the Angoumois grain moth. You must be able to distinguish these from the clothes moths if proper management procedures are to be applied. The outer half of the forewings of the Indian meal moth is coppery brown, while the forewings of the Mediterranean flour moth are pale gray with wavy black lines across them. Angoumois grain moth wings are buff-colored, with the hind pair having pointed ends and a hairy fringe on the back edge which is longer than the wing is wide. In addition, the Indian meal moth and the Mediterranean flour moth are considerably larger than clothes moths, while Angoumois grain moths are a similar size. Click here for related pages on flour beetle, flour moth and weevil control. The Carpet Moth is rarely found but can cause considerable damage when a severe infestation occurs. It is most common in old woolens, horsehair, furs, and feathers. The adult wingspread is somewhat greater than for either the webbing or casemaking clothes moths. Carpet moths can be distinguished from these other species by the fact that the front third of the forewing is black and the rest of the wing is white with a few black or gray spots. The adult moth's head is white. The larva of this moth makes a silk tube as it burrows through the material on which it feeds. The caterpillar feeds inside this tube. Otherwise, the life cycle of this species is similar to that of the other moths. Fabric pest detection requires a thorough knowledge of pest biology and behavior. Be sure to know where pet foods, mounted animal specimens, insect collections, skins, furs, woolens, seeds, organic fertilizers (e.g., bone meals) and other items likely to be infested are stored. You also need to know if there are bird nests under eaves or in the attic, or if there are any wasp or hornet nests around. By knowing the answers to these questions, you can save a great deal of time. You should make a thorough inspection of infested premises to find all sources of infestation before making any attempt at control. It is important to remember that adults of these insects do not feed on woolens or on any of the other materials which may be attacked by the larvae. The presence of adults in an area does not necessarily mean that larvae are in the same area, since the adults may have already laid their eggs in some other room and may be moving around at random or orienting towards bright sunlight shining through windows (they will want to disperse to outdoor areas). Clothes moth and carpet beetle larvae prefer to feed in secluded and protected places. When searching for them, a good flashlight and a knife, nail file or small spatula are essential tools. Larvae will usually be found in dark clothes closets, on furs, woolens, hair padding, bits of carpeting, or other such materials in storage. They are also found in lint, especially under baseboards and around door casings, under the edges of carpeting, in and under upholstered furniture, in collections of animal hair, in air ducts, occasionally in cereals in the kitchen or pantry, and anywhere else where suitable food material might be available. When inspecting for carpet beetle larvae, be especially careful to examine under baseboards, around the bottoms of door casings, under the edges of carpeting, and in closets. Use the knife blade or other implement to bring out bits of lint which are usually found in these areas, and examine them closely for live larvae or their cast skins. 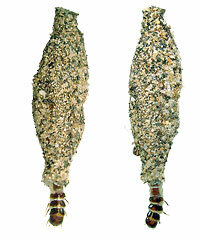 Cast skins are sometimes more numerous than live larvae, but they resemble live larvae so closely that they can be used for identification purposes. Use a flashlight when examining dark closets and other such places. In addition to the above-mentioned sources, it is very important that certain natural sources of infestation be considered. Look for articles of woolen clothing which may have been stored and neglected, and check the premises for old furniture and rugs which may be a source of continuing infestation. Other important reservoirs which are often overlooked include sites which represent the natural habitat of these insects. Sparrow, starling, or other bird nests, inside or outside of the premises, are common points of origin (or continuation) for fabric pest infestations. Wasp nests which are found under eaves and in attics are also common sources of carpet beetle and clothes moth infestations. Moth or beetle larvae feed upon the remainders of dead insects fed to the wasp larvae, on cast wasp larval skins and sometimes upon the living wasp larvae. Another important reservoir of food material for carpet beetle and clothes moth larvae is accumulations of animal hair which may be found quite often in homes where pets are kept. Shed hair may accumulate in heating ducts, beneath furniture, or in hard-to-clean corners. These loose tangles of hair may be sufficient to sustain a small population of fabric pests for a long period of time, even in places where all wool products might have been treated. Clothes moth and carpet fabric pest detection requires a thorough knowledge of pest biology and behavior. Observation can also be a source of useful information, as you will know where pet foods, mounted animal specimens, insect collections, skins, furs, woolens, seeds, organic fertilizers (e.g., bone meals) and other items likely to be infested are stored. They may also know if there are bird nests under eaves or in the attic, or if there are any wasp or hornet nests around. Preventive measures should be practiced whenever possible, because once a "hole" is made the damage is done and may not be repairable. Preventive procedures include preventive sanitation and related chemical measures, and protection by mothproofing of garments or fabrics. Much can be done to prevent fabric pest problems by means of household cleanliness, including thorough and frequent cleaning of carpeting and upholstery with a vacuum cleaner, and brushing, airing, and dry cleaning of susceptible clothing or other articles. Avoid prolonged storage of discarded garments, bedding, any fur or animal pelts (unprotected taxidermy) and old wool rugs or furniture upholstered with vulnerable fabrics. Remember that a clean environment is not conducive to activity of fabric-destroying insects. It is not absolutely necessary that the item itself support fabric insect development. Soiled articles of otherwise indigestible materials can be attacked, or garments of wool blend fabrics can be attacked. In all moth and carpet beetle control work, it is essential to eliminate as many potential breeding places as possible. Old pieces of woolen fabric, cut off pieces of carpeting, old feather pillows, dried flower arrangements or "shadow boxes" (with caches of seeds in them) and other such sources of fabric insect food should be destroyed. Areas under baseboards, behind door casings, under heat radiators, and inside furnace or air conditioning registers should be thoroughly cleaned with a vacuum cleaner to remove as much lint as possible. A vacuum cleaner with strong suction is a good piece of special equipment to use. Careful, routine attention to such sanitation procedures, will be very beneficial toward limiting fabric insect problems. Several preventive approaches can be used in close association with these sanitation procedures. 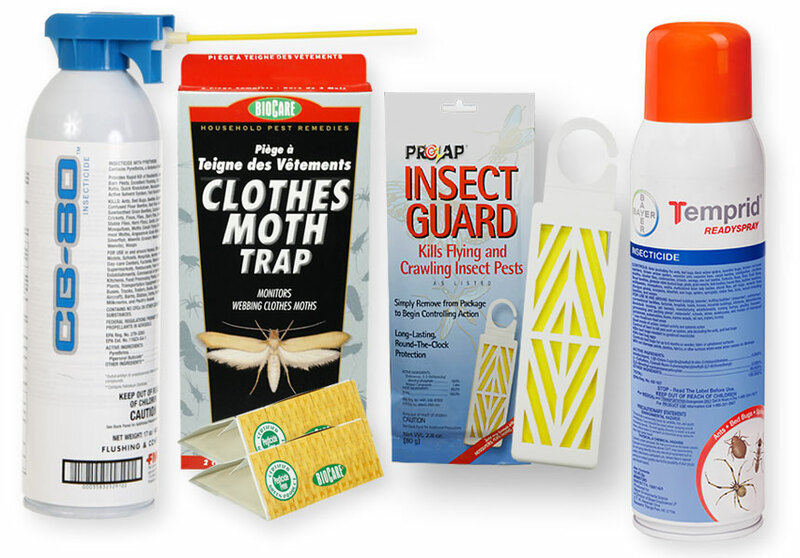 The most commonly recommended chemical for preventive control in storage situations is Insect Guard which acts as a repellent and continuous fumigant. Stored woolens can be interspaced with Insect Guards, as the fabrics are packed into tightly sealed trunks or boxes. Use of tight containers such as large, sealed plastic bags, which are then kept in tight boxes or chests, is important toward obtaining optimum protection for the longest possible time. Remember that it is important to maintain the highest possible concentration of the Insect Guard vapors inside the plastic bag containing the susceptible items. Naphthalene (moth balls) are less desirable to use, and are also less effective. Cedar closets and most cedar chests are ineffective, primarily because a sufficiently tight seal is rarely maintained. Garment storage in cold vaults is an effective preventive measure, especially for very valuable furs or other susceptible garments. Mothproofing and clothes moth control are two different things. Mothproofing implies preventive applications of an insecticide to avoid infestation. Clothes moth or carpet beetle control is the correction of an existing infestation. Mothproofing is often accomplished by a special treatment during the manufacture of woolen fabric or other susceptible items. In some instances it is also a service of a dry cleaning company. Various mothproofers will give protection from moth and carpet beetle damage. These chemicals depend for their action on killing larvae either after light feeding or brief contact (before feeding occurs). Many fabrics which are treated with a mothproofing solution at the time of manufacture are safe from damage until the chemicals are removed, either by washing, dry cleaning or simple degradation. You should never attempt to mothproof articles of clothing. When you desire to have clothing treated, it is usually best that treatment be made during dry cleaning if such treatment is available in your area. Such mothproofing of clothing is usually quite effective over the length of time between cleanings, or for storage during the summer months. CB80, and Insect Guard are currently labeled for general mothproofing applications to other articles besides clothing (carpets, area rugs, tapestries, drapes, etc.). Generally, these are applied to these items after they have been removed and dry cleaned (if possible), and while located in a convenient place which facilitates thorough application. Fine sprays should be carefully applied to obtain thorough coverage, but only after possible staining problems have been considered and tests done to assure such problems will not arise. When infestations of clothes moths or carpet beetles are encountered, a rather extensive program of insecticide applications will usually be necessary after appropriate sanitation has been implemented. Spray insecticides such Temprid Ready Spray or Demand and various non-residual materials such as CB80 are recommended for spot treatment or more general applications, as necessary. Residual sprays are generally applied with a hand sprayer, using a fine fan-spray nozzle. Critical areas of infestation, usually identified during the inspection process, should receive special attention. In carpets, this would be around baseboard areas and under furniture. In furniture, this would be around seams, buttons, other cracks and crevices and padding areas. All insecticides should be applied as a rather fine wet spray, directly to material being treated. Applications to upholstery fabrics should be made lightly, moving rapidly while spraying. Do not soak the fabric, because this will frequently result in staining not caused by the pesticide but caused by the water. When treating carpets, be careful to prevent staining or soiling. If possible, the carpet should be cleaned before insecticide treatment. Be very careful not to soil the treated carpet with dirt from shoes or other sources, and try not to walk on treated areas until after they have thoroughly dried. Whenever possible, it will be best to remove all furniture from a room which is to be treated. This may not be possible due to the size and weight of the furniture involved, or lack of space to put it elsewhere. Furniture can be moved and the carpeting under it treated, after which it can be replaced in its original location. When placing furniture on treated carpet, be sure to place some kind of temporary pad under the casters or skids on the bottom, as well as entirely underneath any other wood or metal articles which may touch the carpet. Failure to do this may result in the formation of rust marks on the carpet from metal parts, or stain marks from the wooden portions of furniture. Both types of stain are almost impossible to remove and can result in costly damage claims. Corrugated cardboard, cut into strips or squares, makes good padding for this purpose, as do folded paper towels, or small paper plates can also be used. The pads should not be removed until the carpet is thoroughly dry, usually after 2 or 3 days. Regardless of the insecticide being used, be sure to keep small children and pets away from treated furniture and carpeting until they are thoroughly dry. These chemicals may be hazardous while they are wet. Check the insecticide product label for any other caution statements which may apply to this use. These residual chemicals are all removed to some extent by subsequent washing, vacuuming and dry cleaning. The insecticide manufacturer's recommendations about length of control and re-treatment intervals should always be observed. If furniture is infested, it may be necessary to open cushions or to remove the covering from the bottom of sofas or chairs, so the padding will be exposed. Special attention should be given to the padding inside upholstered furniture, which may be composed of feathers or horsehair (especially in antique furniture) and is susceptible to insect damage. Exposed padding can then be treated with sprays which will not harm the padding such as Zenprox. When infestations are not heavy, non-residual or contact spray applications such as Temprid Ready Spray will kill both exposed adults and larvae. These sprays should be applied closely to cracks and crevices with as much force as possible to drive the spray in deeply. An aerosol spray such as CB80 is frequently effective in closets. With all such applications, care must be exercised to avoid staining of clothes, walls, or furniture. Many professional pest companies prefer to apply a residual insecticide Temprid Ready Spray or Demand CS to all of the appropriate areas, and then follow up with an aerosol application of a non-residual insecticide such as CB80 to assure complete control of adult or larval stages which may not be directly in the areas treated with the residual material. This dual application approach is especially appropriate when damage is extensive and widespread when many active adult insects have been seen in widely scattered areas of the premises; or during seasons when egg-laying is occurring in the area. One of the most useful products is Ultracide Flea and Carpet Aerosol. Ultracide is used by many rug dealers and manufacturers to control clothes moths, carpet moths and all their life cycles. Ultracide is designed for flea control and not specifically labeled for Clothes moths, but is easy to use, contains an adulticide to kill adults on contact, and an IGR to kill eggs and prevent premature hatching. For rugs, simple spray both sides and roll up. Store in a plastic bag. Rugs can also be stored and layered on top of each other. For carpets, treat as directed for fleas. 1 can will treat up to 2600 square feet. Treat your home, closets, and clothes! Special Sales Price - $67.95 Save Over $8.00!